I was recently sent some Rhythm coconut milk to try - and I used it in a recipe to great effect. You can see it here on the fridge shelf in UK health-food chain Holland & Barrett. This caught my eye and I decided that I wouldn't pick any up as i'd be out all day with it in my bag. At least I know where to get some now though. Next to it there were two bacteria drinks by the same people. As these were about £1.50 and their original product was pretty good I thought I'd give it a shot. Bacteria drinks only really have a scientific effect when you've have disrupted your normal digestive activity with things like antibiotics, but I figured I'd see what happened. As usual there were no real effects - one drink once isn't going to do that much even if you are sick - but the drink itself was nice. 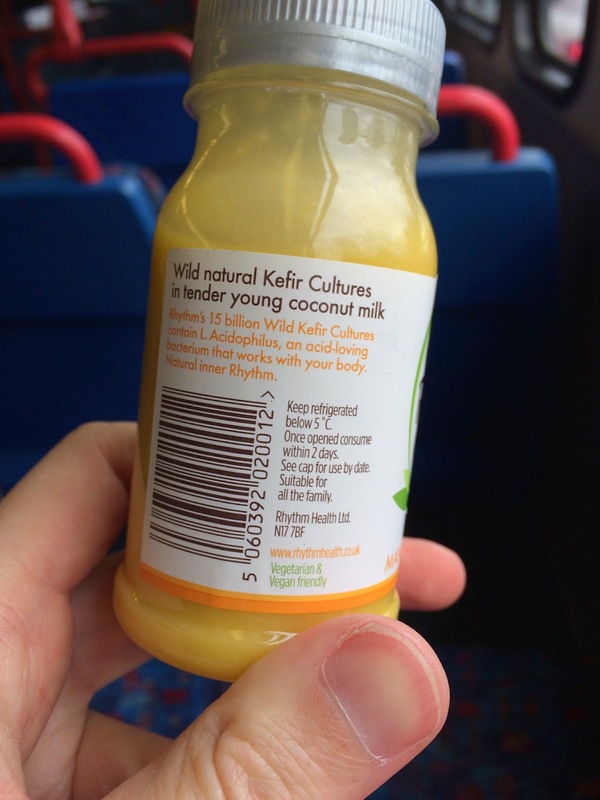 The flavour and texture were both more palatable than most of the coconut water drinks just due to the coarser nature of the liquid and the added fruit flavours. If you are the kind of person who feels they get a benefit from these drinks i'm sure it'd be worth a try. It's not got that lovely tang that a Yakut has, but it's very drinkable. I think I'll stick to the borderline 'protein' drinks instead, purely because I feel like I get more from those, but I'm sure that's just more psychology than actual food science!